Community gardens and tenants‘ initiatives, repair cafés and occupations of vacancies, utopias put into practice and obtained free spaces: The Ruhr area is not exactly the centre of urban activism, but scattered throughout the region groups and initiatives create their city by themselves. 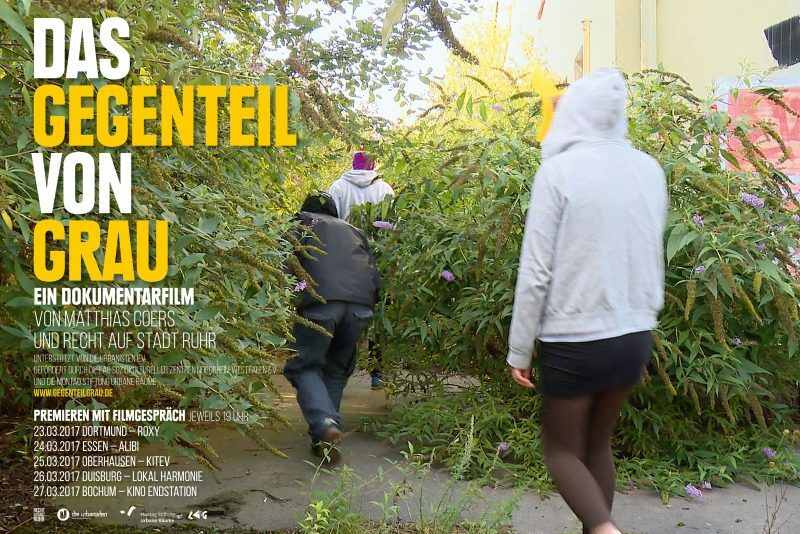 The documentary THE OPPOSITE OF GRAY by Matthias Coers and ‚Recht auf Stadt Ruhr‘ [Right to the City Ruhr] will be on at the cinema in the end of March and introduces 20 of them. An interview. 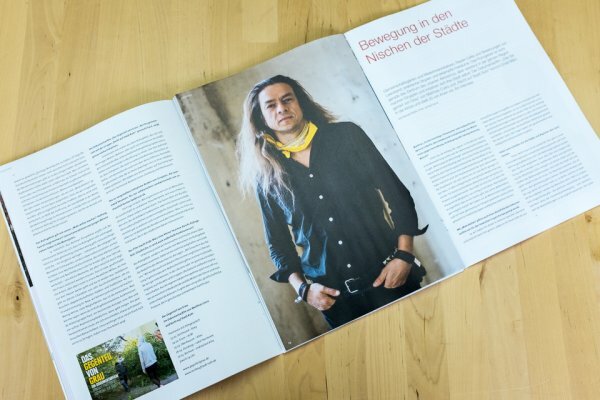 Matthias, you are a sociologist, filmmaker and urban political activist in Berlin. Your focus lies on the struggles of tenants against expulsion, gentrification or forced eviction. Why? When I was looking for my first rented apartment in Osnabrück in the early 1990s, the housing market was already difficult. There were ‚housing shortage action days‘ and demonstrations, and I’ve been part of them, because I’ve always considered it to be important to have a good home that is affordable. Besides, I always had a strong connection to Berlin and of course I also experienced the house-occupying period of the 90s, the project period. Eight years ago I moved to Berlin, into a house where out of a sudden the tenants where confronted with energetic modernization and consequently with rents increased by 40 to 100 per cent. So I have re-examined the subject in order to fully understand: what does it really mean that there is a law that makes such rent increases possible? We have organized ourselves as tenants and at the same time I have also worked as a photographer and made short films for district groups and neighbourhood initiatives. With MIETREBELLEN / RENT REBELS there is also a full-length documentary of you, which has now been screened throughout Europe. Yes, we translated it directly into several languages and toured with the film so that it had more than 300 cinema screenings in about 100 European cities. We have invited tenants to let them have their say and to raise awareness about housing as a social field and an important social issue. The protest has developed in such a way that everyone reflects about the urban society and how affordable housing can be created. The questions have really opened up in the society respectively the urban society. However, there are great differences between the prevailing cities and regions. True, Berlin for example is a special case. It had a housing market that was quite relaxed for a metropolis, because a lot of apartments were built after the decision to make Berlin the new German capital – but the people stayed away. After the year 2000 many people moved here, but at the same time all the public goods were sold in the neo-liberal wave, and finally most of the housing stock was sold, too. Now there’s a great influx into the city and it easily gets into a crisis: people are coming, that’s positive, but at the same time no relevant amount of new houses are being built and the situation is becoming more and more acute. In Berlin, and that is the peculiarity, the people become active. Because first, there is a prehistory – the political sensitivity of the 1970s and 80s, the squatting movement – and second, because the rent increases were so sudden. The people were used to affordable housing costs, until now the average rent often lies between five and six Euros per square metre. In the case of re-letting, you won’t find anything in more or less attractive neighbourhoods below ten Euros rent without utilities. Anyone who has to relocate or moves here as a new tenant will experience this as a shock. And so massive protest has developed rapidly here, there are a lot of initiatives, associations, tenants‘ struggles. In the many events that we have made with RENT REBELS, I have noticed: wherever we were invited, they actually have the same problem, but it is not being articulated, there is a lack of hope, no sensitivity in the broad population, to address the housing issue. And the film may have been a small contribution to groups that use it as an impetus and working tool to this day. The Ruhr area with its ‚What can you do about it anyway‘ attitude seems to be almost the counterdraft. Whole generations of young people prefer to go to the metropolises. Yes, of course: the Berlin point of view reveals the interesting contradiction that there is a lot of activism in the Ruhr area, but at the same time there seems to be only little. All the more important are the initiatives, which – contrary to the mentality – do not wait, but rather implement ideas themselves: a cultural centre, a neighbourhood initiative that runs a small café and provides tutoring lessons for children, a bike repair workshop – such small snapshots, that of course have to be put into practice day by day. This is real social work, but not in a Berlin-Neukölln milieu, where you go only three houses further down and there is something again. Instead there is this characteristic kind of very average, often a bit run-down cities and districts, where the basic mood is: You know, we can’t do so much about it anyway. Few activists, many possibilities, that is the ambivalence: One could say, if you have a small, functioning working group in the Ruhr area, a certain concept, an idea and a real desire to implement it, then much is possible. The few handpicked people who decide to build up something need perseverance. Therefore it is all the more important to help them along a bit by showing their work. The documentary THE OPPOSITE OF GRAY, which you made together with the group ‚Right to the City Ruhr‘, shows precisely such initiatives. Together with people from the Ruhr area, who deal with the questions of rents, housing, but also free spaces, the idea came up to introduce different Ruhr area groups and relate them to one another. The idea behind it is that initiatives, who also work in a wide range of fields, are getting to know each other and that they realize beyond this difference: there are in fact many who try something at their respective location, in their cities. We have concentrated on five places: Dortmund, Bochum, Essen, Duisburg and Oberhausen. The 20 initiatives presented cover an astonishingly broad spectrum – from groups who occupy vacancies to community supported agriculture. 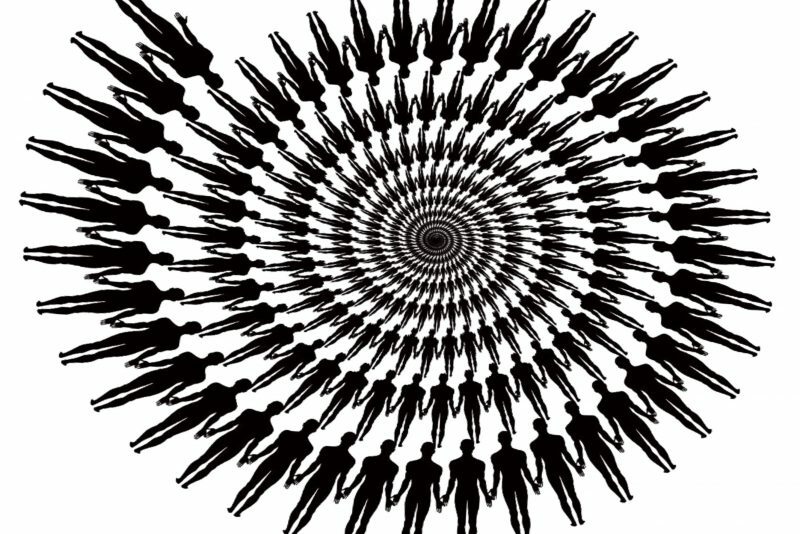 The question is: How do we organize ourselves as people, as a society? There are small but nice examples of how to make something different. This may be a bookshop that works as a collective, or a cooperative that allows different people to live together permanently, safely and fairly well. What can be seen in the film is the wide range of approaches and the diversity of the initiatives that intervene in the urban space. In the end of March the film will make a small tour through the Ruhr area. Do you think it will work beyond the region, too? I do not come as a filmmaker and do something about the Ruhr area, but I am actively co-working with people in the Ruhr area. Again, I couldn’t help but notice how strong the activists‘ desire here is, who say: ‚We need this for our own sake.‘ We will also travel throughout Europe with this film translated into English. Probably there are also approaches and groups in other cities, that we don’t know yet, in the Ukraine or in the post-industrial England. From our own local perspective, we often feel only the supposed insignificance and the troubles experienced at first hand and we underestimate their relevance. But it is a matter of great social processes that take place all over Europe and around the world.